Anna May Fritz was born on October 10, 1920 in Douglas County, Illinois to Thomas and Nettie (nee Neal) Cox. 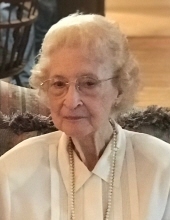 She died Friday, March 29, 2019 at Church Creek Healthcare Center, Arlington Heights. Mrs. Fritz is a former teacher, medical publishing editor and hairdresser for many years. She was a caring homemaker who enjoyed canning and baking with her family and was an accomplished oil painter. Ann was a former member of V.F.W. Post #981 Ladies Auxiliary, and the DAV Auxiliary. Ann is survived by her son, William S. (Lynne) Fritz; her four grandchildren; her five great grandchildren; and her many nieces and nephews. She was preceded in death by her husband William L. Fritz; her infant daughter, Linda May Fritz; her parents and her siblings. Visitation from 10:00 am until time of Funeral Service at Noon, Tuesday, April 2, 2019 at Glueckert Funeral Home Ltd., 1520 N. Arlington Heights Road, Arlington Heights, Illinois. Entombment Memory Gardens. "Email Address" would like to share the life celebration of Anna May Fritz. Click on the "link" to go to share a favorite memory or leave a condolence message for the family.